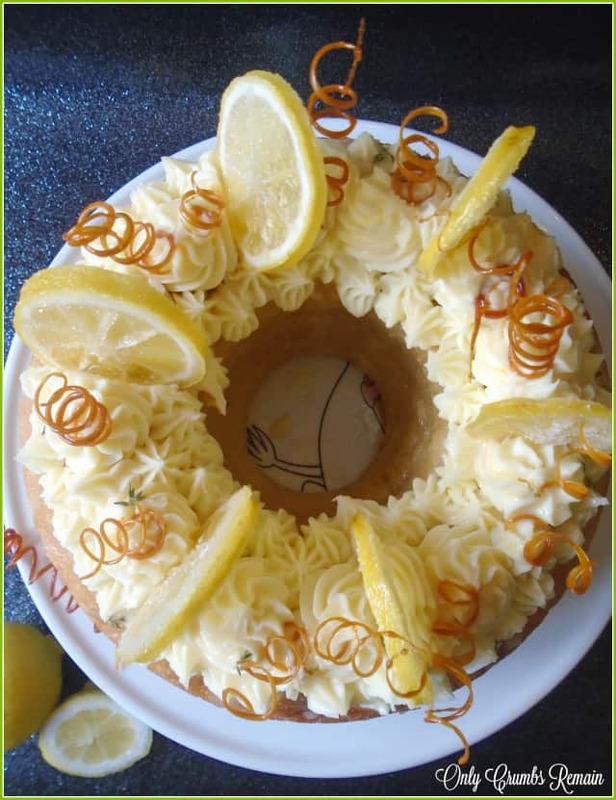 This flavoursome lemon & thyme flavoured Savarin cake is topped with white chocolate & mascapone frosting, lemon & thyme curd, candid lemon slices and completed with spun sugar spirals. 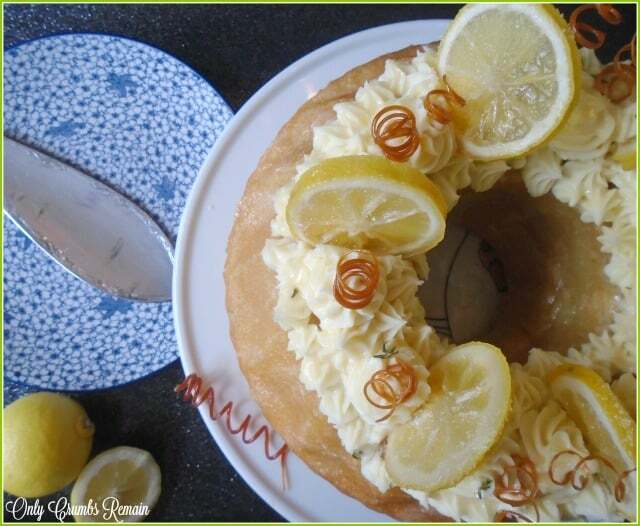 Savarin is a light yeasted cake which once cooked is soaked with flavoured sugar syrup. It’s often said that we should aim to learn something new each day. Be it a fact, a new word, or hone a skill. Whatever it is, it’s so rewarding to put those little grey cells to work to then be able to build on that another day. Just the other day I made my first attempt at spinning sugar. Initially the spiral shapes were nowhere near successful but eventually, after a little perseverance, the technique, although not polished, was refined. Ok, it’s not earth shattering and certainly won’t solve any of the problems which face the modern world, but it was a little triumph in the world of Angela! GBBO and The Bloggers’ Bake Along hosted by Jenny over at Mummy Mishaps has given me the excuse and encouragement to try new baking techniques and different flavour combinations, from building my first gingerbread house, making Danish Pastries, attempting daquiose for our first Marjolaine, and even making my first video for these sweet Yorkshire Puddings. This week’s semi-final episode was no different. In fact all three of the bakes this week would have seen me challenged and learning something new in some shape or form. The signature bake was to produce 24 savoury palmiers, the technical bake saw the remaining four bakers make a Savarin, and the showstopper challenged them to make 36 small and dainty fondant fancies. I must admit that all three of the bakes in this week’s episode, patisserie week, enticed me from the puff pastry of the palmiers, the deliciousness of the savarin to the potential prettiness of the fondant fancies. But realising that we have a savarin tin somewhere in the Only Crumbs Remain kitchen we chose to use it for its correct purpose, rather than making bundt cakes with it! Now, Paul’s savarin recipe looked amazing having been flavoured with an orange syrup and topped with colourful berries and Chantilly cream, but wanting to change it up a bit I opted to go with a slightly different flavour combination and decoration style. 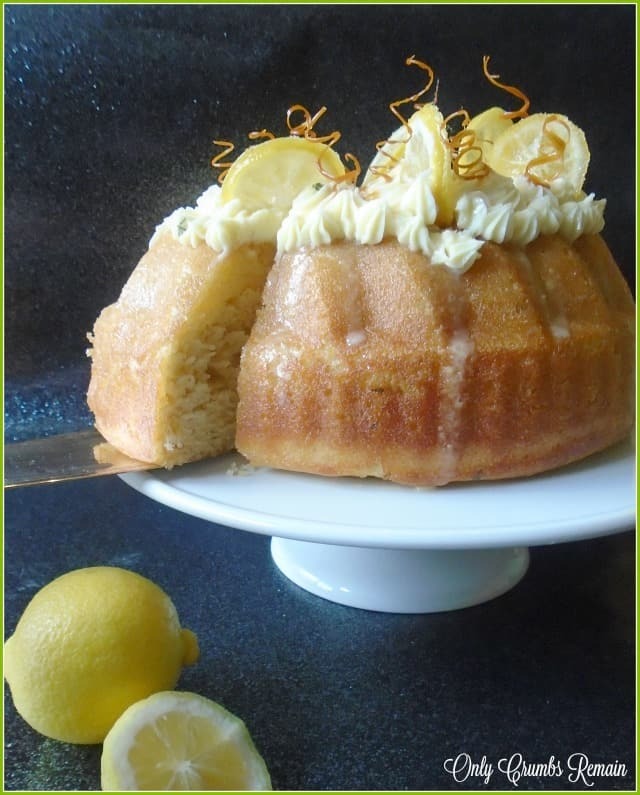 Having tried lemon and thyme together in a sweet bake for botanical week, with a lemon meringue pie with thyme pastry, we (or rather I) decided to try the same flavour combination in this savarin cake. The cake smelt amazing as it emerged from the oven, the savoury notes of the thyme being evident though not overpowering. The thyme was also used in a homemade lemon and thyme curd which I made to drizzle over the top of the finished savarin. Let’s face it, if you fancy trying this curd it’ll have to be homemade as it’s very unlikely that you’ll find it on the shelf at your local supermarket! The wonderful sharpness of the lemon, which we all know and love, was still present but the delicious notes of the fresh thyme was quietly evident making a beautifully change to the usual curd. Although the sugar shards looked great on the bakes in the GBBO tent, I chose to push myself a little further by attempting a technique new to me and spun some sugar into spiral shapes. After reading Desserts by James Martin about spinning sugar, covering the floor with reams of newspaper, closing the kitchen door whilst our feline friend slept on the sofa, and putting my concentration head on I was ready to give it a whirl. I must admit that it took me a while to collect enough spirals of spun sugar to decorate our savarin cake, and some perseverance was required after almost calling it a day when I seemed to have stalled at collecting just two. But then something clicked and I was on a roll making spirals relatively easily. Happily these were made without too much mess to the kitchen surfaces and no burns being made to my hands and arms! So what did I learn when attempting to make spun sugar spirals? Sadly, the sugar work doesn’t last long depending upon the humidity levels. It soon begins to return to caramel, therefore the shapes need to be made just before serving. candid lemon slices and completed with spun sugar spirals. 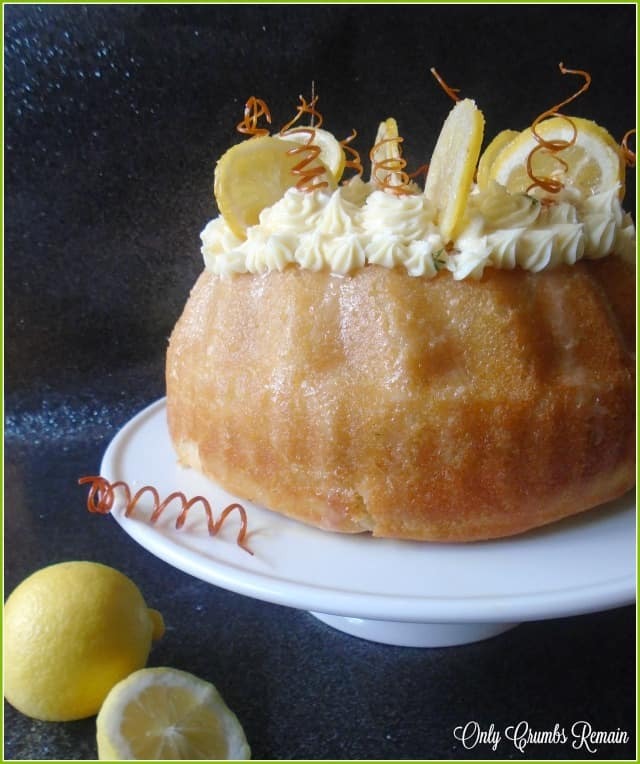 Savarin is a light yeasted cake which once cooked is soaked with flavoured sugar syrup. 1. Make the savarin batter. Place the two flours, caster sugar, instant yeast, lemon zest and chopped thyme leaves into a large bowl. Mix to combine. Make a well in flour mixture. In a jug mix together the eggs, milk and salt. Pour into the flour mixture. Using a wooden spoon beat together for about 5 minutes until it’s thick sticky and smooth. Gradually add the very soft butter. Continue beating until it is smooth elastic and shiny. You may find this step easier using a stand mixer. 2. Prove the mixture. Cover the savarin batter with cling film (or a shower cap used only for baking). Set aside until the batter has doubled in size. The time taken will depend upon the ambient temperature of the room, though as a guide it took ours just over an hour. 3. Make the syrup and candied lemons. Mix together the sugar, water and lemon juice in a heavy based pan. Set over a low to medium heat to dissolve the sugar. Meanwhile clean and slice the lemon about 3mm thick. Once the sugar has dissolved lay the lemon slices into the syrup in a single layer. Slowly simmer the syrup for 15 minutes until the rind appears softened and slightly translucent. Remove the lemon slices from the pan gently, allowing the syrup to drip away before placing them onto a sheet of kitchen roll. Set the lemon slices aside to dry. This can take a few hours. They will always remain tacky. Set the syrup aside. 4. Make the lemon and thyme curd (optional). Place the cubed butter, sugar, lemon juice, and zest into a bowl. Add the washed thyme sprig. Create a bain marie without the base of the bowl touching the water in the pan. Set over a medium heat to allow the sugar to dissolve and the butter melt. Remove the bowl from the heat and set it onto a cloth. Reduce the temperature under the pan. Add the lightly beaten egg to the bowl through a sieve to remove any sinew. Place the bowl back onto the pan to cook the curd. Stir constantly with a wooden spoon. The curd is ready when a finger can trace through the curd on the back of a spoon without the curd running into the track. Should you need more details check out my lemon curd on http://www.onlycrumbsremain.co.uk/2016/05/homemade-lemon-curd.html 5. Make the frosting. Place the mascapone into a bowl. Stir to slacken. Avoid over mixing. Add the melted white chocolate. Stir thoroughly until smooth and well combined. Place into the fridge for at least an hour to firm up.6. Prepare the savarin tin. Thoroughly grease the savarin tin with butter, ensuring that all of the corners, dips and the funnel are greased.7. Fill the mould. Once the savarin batter has doubled in size gently spoon the batter into the prepared tin. Use a large metal spoon for this. Allow the batter to take the shape of the tin itself, though aim to distribute the batter evenly. 8. Prove again. Cut a sheet of clingfilm and oil it lightly. Cover the savarin tin with the oiled clingfilm (oil sidedown). Set aside again until the batter is 3/4 of the way up the tin. This may take 45 minutes – 1 hour. 9. Preheat the oven to 180c / 160 Fan / Gas 4. 10. Bake. Once the batter has risen 3/4 the way up the tin place the cake into the centre of the oven. Bake for 20-25 minutes. You may need to rotate the tin after about 17 minutes. The savarin cake is ready when a skewer inserted in the sponge comes out clean. 11. Cool the cake. Remove the cake from the oven and set onto a cooling rack for 5 or 10 minutes. 12. Soak the savarin sponge. When the cake is cool enough to handle, gently remove it from the tin. Pour a third of the prepared syrup into the savarin tin. Carefully replace the cake into the tin to allow the syrup to absorb into the cake. Use a pastry brush to paint some more of the syrup into the base of the cake. Allow the cake to cool completely. 13. Turn the cake out. Position your cooling tray in a roasting tin (or similar). Remove the cake from the tin carefully and place onto a cooling tray. Use a pastry brush to paint some more syrup over the surface of the cake. Repeat this every 5 or 10 minutes until you think suffient has absorbed into the cake. Most of the syrup should be used.14. Start to decorate the cake. Place the cold cake onto your serving plate. Stir the chilled mascapone through. Place into a piping bag fitted with a star nozzle. Pipe rosettes of various sizes over the top of the cake. 15. Continue decorating the savarin cake with lemon curd (optional). Place half of the curd into a pudding bowl. Stir the lemon and thyme curd. You may need to add a dribble of water if it is a little thick to drizzzle. Using a teaspoon drizzle about half of the curd over the top of the cake.16. 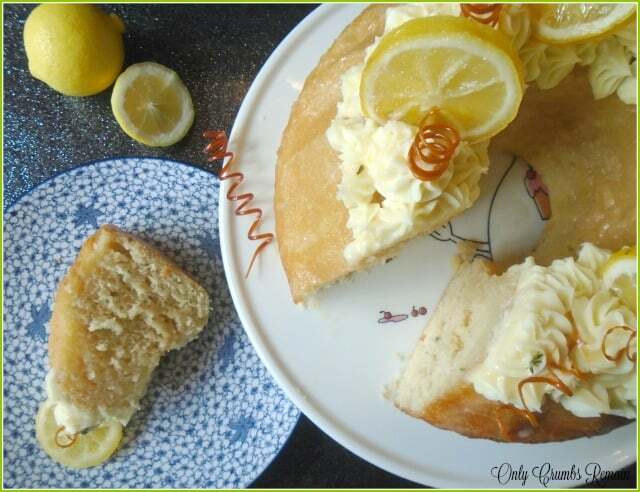 Finish decorating the cake with slices of lemon. 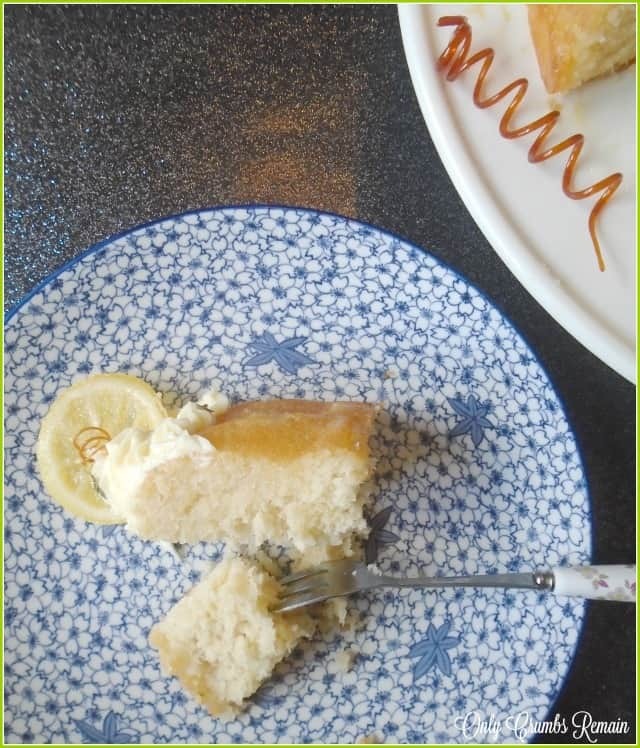 Gently position the lemon slices into the top of the cake, equally spaced.17. Make the spun sugar spirals. Place the sugar into a heavy based pan with a wide base (or even a frying pan). Ensure it is evenly distributed over the base of the pan rather than mounded up. Set over a low to medium heat. Allow the sugar to melt. Do NOT stir the sugar. Once it starts to melt / caramalise tip the pan to encourage more of the sugar crystals to melt and caramalise. Once the sugar has completely melted and it has turned an amber colour take the pan off the heat to allow the caramel to cool. You can use as spoon to stir the mixture at this point. Once the sugar is the viscosity of golden syrup start to shape the sugar. Take a spoonful of syrup, allowing it to stretch back down to the pan. Wind the stretched sugar around a cook’s steel or the handle of a wooden spoon. REMEMBER THE SUGAR IS STILL VERY HOT! If the sugar becomes too thick to work with place it back onto the heat for a short while to remelt. Any broken shapes can be placed back into the pan to remelt and shape again. Once you have about 12 curled sugar pieces arrange them over the top of the cake. a) Depending upon the humidity of the room, the sugar work will soon spoil, therefore make it just before serving. Awe thank you Helen. I really enjoyed making the spun sugar, though i must asdmit that the thicker pieces were a lot easier to handle – it's so delicate and brittle! I do try to learn something new – invariably it's nothing too exciting – perhaps a fact or something like that but occassionally I like to try a new skill – so earlier this year I larnt to throw clay on a potters wheel. i've still a way to go on that to be described as competant though! Aw thank you Alice 🙂 it was definitely a bit of trial and error to be honest, but then after a while of playing with it and then re-heating I noticed the consistency where I was getting better shapes. This looks stunning!! Love the sugar work on top! Well done! The flavours in this Savarin sound amazing. Love the thyme addition with the lemon and anything with white chocolate and mascarpone has me hooked straight away. Love the idea of 'candid' lemons. I hope they were as outspoken as they look! 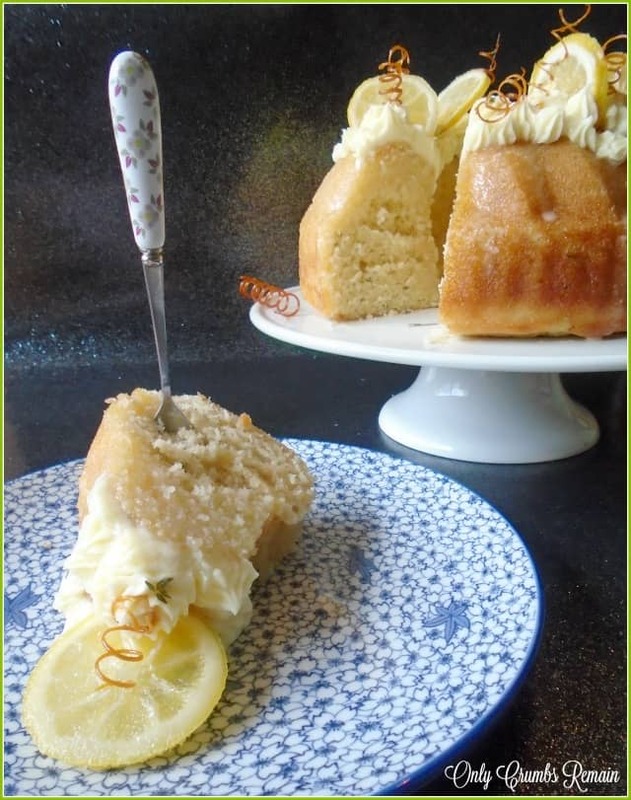 Thank you Kate 🙂 It's amazing how well thyme works in a sweet bake when accompanied by lemon, and I couldn't agree more about white chocolate & mascapone frosting – serious yum! Haha, do you think the lemon slices look outspoken?! To be honest I think I sliced them a tad too thick but they were still lovely and certainly brought something extra to the bake. It's amazing (and disappointing) how quickly spun sugar spoils isn't it, but I guess if it's made just before it's required you can still get that 'wow' effect. I took the cake to my parents the day after I made it for them to have a look and enjoy a slice with me and all that was left of the spun sugar was brown blobs where the spirals had sat! Oh this is so beautiful Angela, the lovely,flavour of the cake, your piping and your lovely sugar spirals! What a fantastic bake. I love savarin (and rum baba, which is basically the same cake) but haven't had it for donkey's years… you may have just given me an excuse to make it again! Go on Nico, take a walk down memory lane and bake one (or even the rum baba). 🙂 Thank you so much Eb. It's amazing how well the thyme works with the lemon even in a sweet bake. 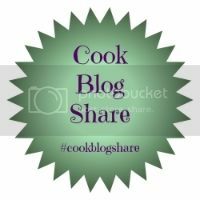 Ooh I love learning something new Eb, even if it's just a small thing – but I totally agree there's always something to learn when blogging! Ooh a gin and tonic themed savarin sounds amazing Jenny, but I know what you mean regarding the time front. I always plan my week out and expect to achieve X,Y & Z but invariably something or someone needs my help and then I've usually lost half a day here and there. hey ho, guess that's life. Ooh yes, you definitely need to pop it to towards the top of 'need to bake' list. 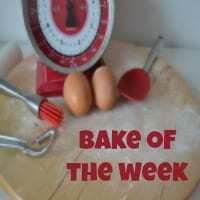 Angela – your bakes are so impressive! This looks and sounds both delicious and stunning – yum! The sugar spirals looks amazing, perfect shape. I like your savarin and the flavours sound great too. I think this looks stunning and I'm so jealous of your sugar work- I've never tried it before but am not confident!